Home » Blog » The Give!Guide Launches Today! We are excited to be rolling right along with the 2016 Give!Guide launch today! The Give!Guide works to increase the number of young supporters of local nonprofits and their incredible work by creating a sense of philanthropy across the city. Or, as the guide’s website puts it, they “handpicked 141 of Portland’s most impactful nonprofits and put them under one digital roof.” The Community Cycling Center is fortunate to be one of those 141 nonprofits. Portland Design Works will offer daily 20 percent discounts of donors of $50 or more and one big give day with a $500 commuter package. Nutcase Helmets will host a raffle every Tuesday for one of their eye-catching, brain-protecting helmets. Salt & Straw is teaming up with Congressman Earl Blumenauer and his famous (notorious?) fruitcake recipe. Ice cream proceeds will fund the Community Cycling Center this holiday season. 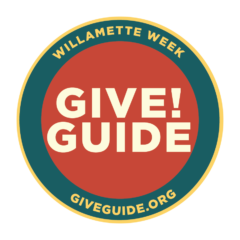 All Give!Guide donors who give $10 to $999 will receive discounts and freebies in the Chinook Book mobile app from businesses all over Portland. Donors who give $1,000 or more will receive one of three kinds of thank you bags delivered to their home.